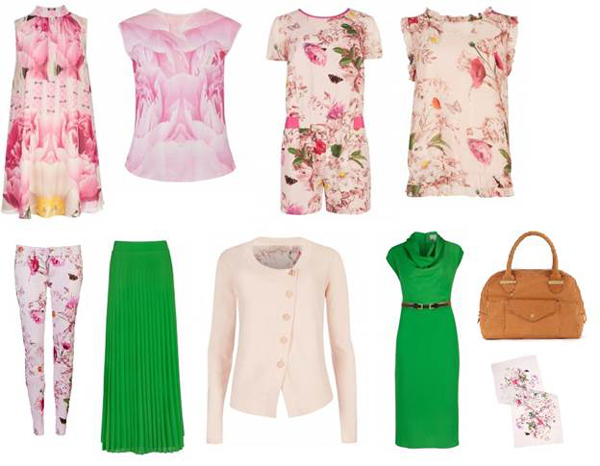 Spring has sprung, and Ted Baker London is ready for it! The label's feminine prints never cease to inspire, but the latest looks especially have me dreaming of warm days in English gardens. The new environmentally-friendly capsule collection, "Natural Kingdom," features soft pencil drawings and bright, photographic flowers, butterflies and insects, all on recycled cotton and polyester. As an addition to the regular SS13 collection, you won't find these pieces at Ted Baker's Newbury Street store, but most are available online. Ted Baker rocks, a little on the pricey side, but in the sale it's worth investing. This brand not only has a sense of humour (you should see the Xmas windows) but well made pieces. I didn't realise they had this 'environmentally friendly' collection. Ted Baker has one of my favourite collections this season. Beautiful prints and amazing neons, seriously some of the brightest, most shocking pinks mixed beautifully with subtle neutral tones. gorgeous- I just love the floral prints that have been out and about this year- these are particularly lovely! I love these pieces - so perfectly spring. Glad you are back! Missed you!